Google Webmaster Tools features "Geo-targeting" tool which handles geographic data, (not language data) and allows site owners to set targets. It allows them to connect their sites to a country, as an intended audience for their websites. If your site has a neutral top-level domain, such as .com or .org, geotargeting helps Google determine how your site appears in search results for geographic queries. According to Google, setting a geographic target won't impact your appearance in search results unless a user limits the scope of the search to a certain country. A good example of where setting a geographic target would be useful is for a restaurant website: if the restaurant is in Nigeria, it's probably not of interest to folks in France. But if your content is in French and is of interest to people in multiple countries/regions, it's probably better NOT TO restrict it. So, if you're targeting users in different locations—for example, if you have a site in French that you want users in France, Canada, and Nigeria to read—Google doesn't recommend that you use this tool to set France as a geographic target. 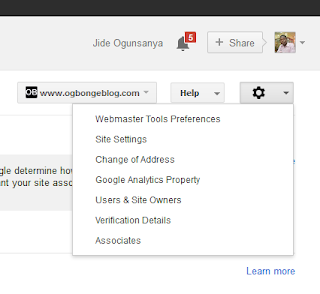 ==> Log in to Google WebMaster Tools page. 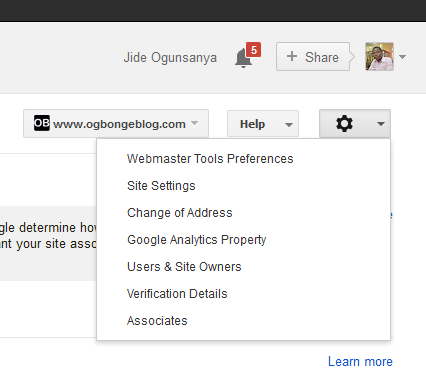 ==> On the Webmaster Tools Home page, click the site you want. ==> Click the gear icon , and then click Site Settings. ==> In the Geographic target section, select the option you want and click SAVE. If you want to ensure that your site is not associated with any country or region, select Unlisted in the drop-down list. Sites with country-coded top-level domains (such as .ng) are already associated with a geographic region, in this case -Nigeria. In this case, you won't be able to specify a geographic location.